The 2016/17 Loyalist Lancers women’s basketball team. Photo by Loyalist Athletics. BELLEVILLE – The Loyalist Lancers have a busy week coming up with three home games scheduled for this week. 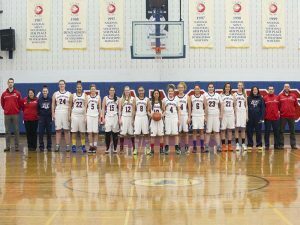 The Loyalist Lancers women’s basketball team will take on Durham College Tuesday at 7 p.m.. Durham is ranked second in the eastern division. Currently, the Lancers are ranked fifth in the division. Durham’s Lindsay Panchan, who wears number 20, leads the eastern conference in points per game with an average of 23 points. For the Lancers, she will be one to watch tonight. The men’s and women’s volleyball teams will take on Durham on Thursday night at Loyalist, starting with the women’s game at 6 p.m. and the men’s following at 8 p.m. The women’s Durham volleyball team is ranked first, with Loyalist trailing close behind in third. The men’s Durham team is ranked second in the eastern division, while the Loyalist men are ninth. QNet News will be at the game tonight.